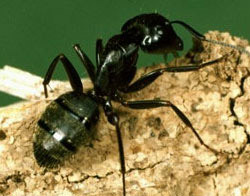 The Carpenter Ant is most prevalent in the mountainous areas over Hemet, Murrieta and Temecula. Carpenter ants are considered wood destroying organisms by the state of California, and require similar treatments as other wood destroying species of pests, such as termites and carpenter bees. Carpenter ants are possibly the most important structure-infesting ant species because they chew wood to create a hollowed-out nesting site for the carpenter ant colony. Although most damage caused by carpenter ants is not significant to weaken the structural integrity of your home or office, there are instances where carpenter ants can cause damage to wood that is already weak due to pre-existing moisture conditions. Most carpenter ant services require a quick inspection of the carpenter ant infestation before a recommendation and quote for treatment can be given. The inspector will then recommend an appropriate treatment to get rid of the carpenter ants. The service can be scheduled for a later date or performed immediately. *For the most part, a main/parent carpenter ant colony needs moist wood to survive. Wood members that are affected by improper water drainage, poor ventilation and plumbing leaks are more susceptible to a carpenter ant infestation. However, satellite carpenter ant colonies can infest dry wood as long as water is readily available nearby. It should be noted that a carpenter ant problem won’t go away simply by fixing the contributing conditions.